Space Camper IPA, our newest year-round offering, is on a mission to save beer drinkers from heavy-handed bitterness with juicy, tropical fruit flavors imparted by massive late additions of Ekuanot, El Dorado, and Galaxy hop varietals. 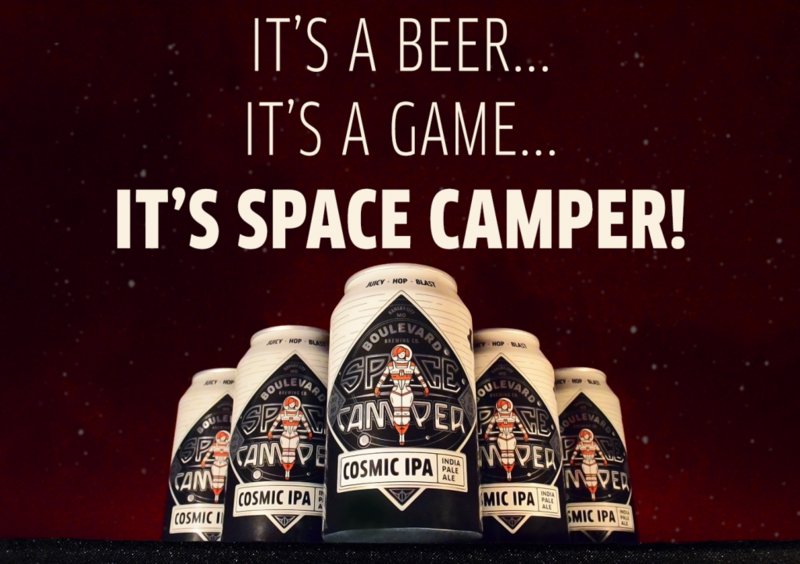 Space Camper IPA, the game, sends YOU on a mission to guide our fearless heroine as she blasts off in her spaceship to save the earth from an Intergalactic Planetary Attack. Crack open a can of Space Camper the beer and be transported to a new universe of India Pale Ales, where you'll be rewarded with aromas of juicy mango, peach and pineapple, plus flavors of fresh citrus, stone fruit and watermelon. Dive into Space Camper the game and be transported to a universe filled with danger. Take out the ships threatening our planet, collect hop cones and beer cans to gain helpful power-ups, and be rewarded with the opportunity to win weekly Boulevard prize packs or the grand prize of a Nintendo Switch*! Click/tap below to accept your mission. Help us save the earth; it's the only planet with beer! *Defeat the first mini-boss (Level 8) to access entry form. Check out official contest rules here.